The vampire Angelus, now known as Angel, has a human soul, but committed terrible crimes in the past. 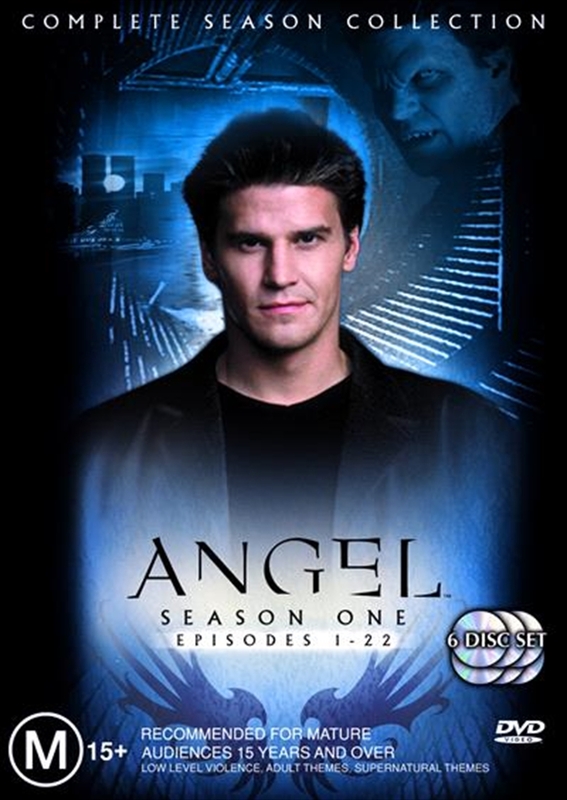 Seeking forgiveness and trying to redeem himself, he moves from Sunnydale (and a relationship with Buffy Summers, of 'Buffy the Vampire Slayer') to Los Angeles, where he helps the downtrodden by thwarting the supernatural creatures that prey on them. 6 DVD's - 'City Of', 'Lonely Hearts', 'In The Dark', 'I Fall To Pieces', 'Rm w/a Vu', 'Sense & Sensitivity', 'Bachelor Party', 'I Will Remember You', 'Hero', 'Parting Gifts', 'Somnambulist', 'Expecting', 'She', 'I've Got You Under My Skin', 'The Prodigal', 'The Ring', 'Eternity', 'Five by Five', 'Sanctuary', 'War Zone', 'Blind Date', 'To Shanshu in L.A.'.